I’m researching how to justify investments in collaboration-supporting technologies (e.g., blogs, wikis, and private social networks) when the business processes they support are numerous and spread across multiple participants who may not always share common goals. Examples are applied R&D and Federal acquisitions. One question is whether collaboration-supporting technologies should be viewed as business applications or as part of the IT “infrastructure.” In my experience, generating a business case for a business application tends to be simpler than for a change in infrastructure. Why? It’s usually easier to link investments in technology and changed business processes to specific business costs and benefits than it is with more general infrastructure investments. The situation is certainly real. In addition to the current Administration’s focus on “open government” and “transparency” that is rippling through so many different Federal agencies, agencies such as the GSA are also experimenting with the use of collaboration tools not only for “general purpose” collaboration but also in “live” acquisition settings, as shown by the Better Buy Project and its pilot wiki. While I firmly believe in the value of collaboration and sharing information and expertise in any complex project management setting, it’s still necessary to look objectively and analytically at the costs and benefits associated with applying collaboration technologies and processes to complex government sponsored acquisition programs. A basic question is whether the effects of introducing collabration tools and techniques are worth the costs. To help answer this question I’m developing a “procurement collaboration concept map” of the main issues that such an assessment could address. I’m also interviewing procurement experts about this model. 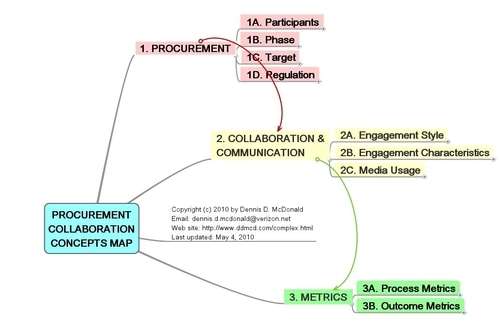 Overall, the acquisition process (pink) “drives” (red arrow) selection of the Collaboration & Communication Methods (yellow). Use of these methods in turn “generates” (green arrow) outcome Metrics (green box). I put parentheses around both “drives” and “generate” since I’m also researching the mechanisms by which these three very broad classes of variables interact. 1D. Regulation. What is the regulatory environment like in which the procurement is taking place? For example, is it stable or is it constantly changing? 2A. Engagement Style describes how the different participants in the process communicate with each other during the procurement process, e.g., are one to one or group meetings used to exchange information, are web sites and emails used, are social networks or collaboration networks used for discussion, etc. 2B. Engagement Characteristics refers to the transparency and interactivity of communications, e.g., is information exchanged about vendor capabilities restricted in distribution, are technical requirements published and discussed openly among potential vendors, etc. 2C. Media Usage refers to the specific channels used for exchanging information, e.g., web sites, letters, printed documents, email, webinars, etc. 3. METRICS are tools that measure the potential effects of using collaboration technologies to support the acquisition process. 3A. Process Metrics describe how the procurement process is managed from begining to end. 3B. Outcome Metrics describe how well the acquired product or service satisfies its target objectives. As with any large or complex process, it seems clear that how you evaluate costs and benefits will depend on your own goals as well as the nature of your own participation. If you are interested in sharing your thoughts with me about this topic, please let me know. Copyright (c) 2010 by Dennis D. McDonald. Contact Dennis via email at ddmcd@yahoo.com or via his office phone at 703-549-1030. This article was revised May 7, 2010.